Sheffield Botanical Gardens — Alison Hunter — 4th December 2017. 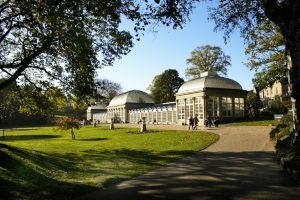 In 1833 a peti­tion was sent to the Master Cutler (Thomas Dunn) by the Town Trust regard­ing the estab­lish­ment of a garden for the people of Sheffield. This was approved by the newly formed Town Council in 1843. A share hold­ers’ scheme was set up and shares sold to the public. Unfortunately the scheme went bust in 1897 and they were bought by Frederick Mappin who was the leader of the Town Trust. Eventually the Sheffield City Council became owners in 1951 and are still the present man­agers. 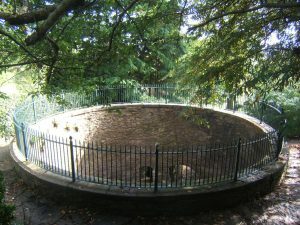 Robert Marnock was the first cur­ator and he designed the gar­dens into a nat­ural tree landscape-many trees being planted on mounds which are still in evid­ence today. The main gate. Courtesy of Sheffield Botanical Gardens. 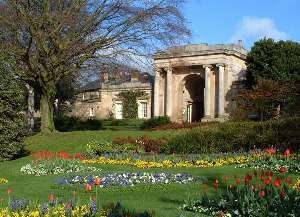 The main gate­way was designed by Ben Broomhead Taylor in1848 when the curator’s house was also built. Samuel Osbourne (chair of the Sheffield Town Trust donated Osbourne Fields to enlarge the gar­dens in 1934. A fea­ture of the gar­dens is the Bear Pit. It was never used for bear bait­ing but for a public attrac­tion where the bears had a large tree trunk in the middle of the pit to climb up. The FOBS ( Friends of the Botanical Gardens)was formed in 1984) This is a volun­teer group of nearly 100 mem­bers who play a vital role in man­aging the gar­dens and, after spend­ing many years in a prefab build­ing, got a new pur­pose built centre cost­ing 2 mil­lion pounds. The money being raised by public dona­tions and char­it­able trusts. The new build­ing was opened by the Duke of Devonshire in 2017. Don Williams was cur­ator during the 80’s and 90’s leav­ing in 1990. Much of his good work was neg­lected and the gar­dens deteri­or­ated. After a big reor­gan­isa­tion they were re- designed and and opened by Michael Palin in 2008. The gar­dens also fea­ture a statue of “Pan” (donated by Charles Clifford) and a memorial statue to the Crimean War. The con­ser­vatries. Courtesy of Sheffield Botanical Gardens. In WW2 the con­ser­vat­or­ies were badly dam­aged, and after a lot­tery fund­ing of 5 mil­lion plus 1.3 mil­lion raised by the Trust and dona­tions world wide, the con­ser­vat­or­ies were re built. ( Most of the glass panels were hand made ) Prince Charles opened the new build­ing in 2003. With regard to the gar­dens them­selves they are divided into many dif­fer­ent areas. Nursery area: Here Sheffield Uni holds plant trials and they devised a plant­ing scheme for the London Olympics. Prairie garden: Started in 2004 dis­play­ing swathes of meadow plants and grasses. Evolution Garden: Where the fos­sil­ised tree stump(found at Attercliffe) is dis­played and also fea­tures ancient plants ie Ginko and Dawn red­wood. Mediterranean Garden: Featuring plants from Australia, Chile and California. These thrive in a micro cli­mate caused by the area being sheltered and south facing. Himalayan Garden: Where Chris Chardwell brough back seeds from Himalayan plants which he ger­min­ated and then planted them in the garden. The garden also holds the National Collection of Weigellias, , Dervilla, and Sarcococca. The gar­dens are a delight to visit and Sheffielders should be very proud of them and appre­ci­ate all the work that has gone into them over many years. Alison’s talk was much appre­ci­ated by the club, which was evid­ent by the number of ques­tions she was asked and the round of applause at the end. Helen Till, a retired clin­ical nurse, now has a new role as a resus­cit­a­tion officer in the hos­pital envir­on­ment. She men­tioned that in the UK every year, 30,000 cases of sudden car­diac arrest (SCA) occur. How does CPR help? By per­form­ing chest com­pres­sions (and rescue breaths) this pumps blood and oxygen around the body. Most SCA cases are due to abnor­mal heart rhythm. The major factor lim­it­ing sur­vival is that SCA and AED (defib­ril­lator) are used within the crit­ical time (con­di­tions are optimal only for a few minutes after the onset but can be exten­ded by effect­ive CPR. Defibrillation helps by deliv­er­ing a high energy elec­tric shock to the heart through the chest wall and chest com­pres­sions also help. Do CPR until ambu­lance arrives. Helen demon­strated on a man­nekin how to apply CPR and use a defib­ril­lator. The AED, when activ­ated, gave recor­ded instruc­tion at every step. It told how and where to place the pads which had to be applied to bare skin. Members of the club volun­teered to per­form the tech­nique on the man­nekin and were amazed at how much effort was required to do the CPR. There were mul­tiple ques­tions from the floor and Helen answered them all. She was thanked for her invalu­able talk and demon­stra­tions. Rotten Boroughs — Paul Humphries — 5th June 2017. Paul gave us an inter­est­ing talk into “behind the scenes activ­it­ies” in many local coun­cils, and how the media has been involved in expos­ing mal­prac­tices. Some local coun­cils work hard and others have been involved in cor­rupt prac­tices and should have been brought to account. Paul men­tioned that the “Private Eye” pub­lic­a­tion was report­ing many cases of alleged cor­rup­tion but the stor­ies were not taken up by the national press and thus the prac­tices were allowed to con­tinue. Accounts of misuse of coun­cil money were many, accord­ing to Paul. It has been known for coun­cil­lors to arrange expens­ive trips to places such as Chicago, Japan and Africa on the pre­text of attend­ing meet­ings which would have little impact on the lives of people in their con­stitu­en­cies. The Donnygate scan­dal was the worst case of gov­ern­ment cor­rup­tion since the Poulson scan­dal in the 1970’s. With Donnygate, two former coun­cil lead­ers, two former mayors and twenty-one coun­cil­lors were con­victed of fraud. The unrav­el­ling of the scan­dal owed a lot to Ron Rose, a local res­id­ent and former coun­cil­lor. He approached the media and a three-year police enquiry was launched. Senior civil ser­vants had to be brought to Doncaster to run local gov­ern­ment. In Lincolnshire (a Conservative-run coun­cil), the leader of a county coun­cil had the route of a £25 mil­lion road scheme redrawn to boost the value of his land was jailed for 18 months. Paul men­tioned how a coun­cil­lor in Rotherham spent money from an anti-poverty fund set up to alle­vi­ate poverty in the former coalfield areas. This money was spent on tick­ets to race meet­ings, foot­ball matches, pros­ti­tutes and, in all, £172,000 was taken from the anti-poverty fund to be spent on coun­try jaunts and booze binges. Andrew Norfolk, chief invest­ig­at­ive reporter of The Times, received “Journalist of the Year 2014” award for his invest­ig­a­tion into the wide­spread exploit­a­tion of teen­age girls in north­ern England. Thus many wrongs can be righted by good journ­al­ism. Paul answered many ques­tions from the floor and was thanked for his inter­est­ing account. 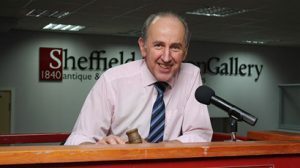 Michael sur­veyed the assembled audi­ence and came to the con­clu­sion that none of them were likely to fetch much at auc­tion, so he com­menced his lec­ture about the real antiques trade. Michael Dowse ori­gin­ally hailed from Scunthorpe. His grand­father was Arthur Edward Dowse, his father was Edward Arthur, but his mother defied the family tra­di­tion and called him Michael. His father sent him to col­lege to train as a chartered sur­veyor how­ever, Michael’s girl­friend lived 40 miles away so he spent much of his time trav­el­ling back and forth to see her. Subsequently he failed his exams. He was then sent off to Sotheby’s in London as an appren­tice, and spent most of the time clean­ing silver. He left after four weeks and was then art­icled to Bolton and Cooper auc­tion­eers who had offices in Malton. They auc­tioned prop­erty, fine arts and also live­stock and agri­cul­tural machinery. After a move to their Scarborough branch he returned to Sheffield as his father was unwell. He bought his father’s busi­ness of E.A. Dowse off him, and developed the busi­ness by making con­tacts with soli­cit­ors and pro­bate depart­ments which offered a way into obtain­ing items for auc­tion. He related a tale of a lady soli­citor who was to value the house of a deceased woman, he wondered if there were any items in the house that he could sell. The soli­citor greeted him wear­ing a mask! He wondered why? On enter­ing the house he was over­come by the dread­ful smell. The deceased woman had cared for stray cats and when she died the cats still gained access through a broken window. The smell was unbear­able. He took only two items of fur­niture to the sale­room which he washed down out­side for over four weeks but the ingrained smell was still obvi­ous when the items were even­tu­ally sold. At one clear­ance house they found a safety deposit box which was empty. It did, how­ever, have a list of instruc­tions to where a cache of £3000 gold coins would be found. The instruc­tions read like a treas­ure map — so many paces left, right, upstairs, etc. which led them to a remov­able floor­board. Underneath the floor­board were the coins. These were sold for £25,000. Michael stressed the import­ance of having proven­ance of items for sale. He quoted the sale of seven medals awar­ded to Squadron Leader Clayton. The medals were accom­pan­ied by photos and details of all the 145 mis­sions he had flown, first as a nav­ig­ator and then as a pilot. He was regarded as a hero and a dare­devil. The medals on their own would have fetched £3–5000 but, with the accom­pa­ny­ing proven­ance, fetched £28,000. Michael gave us an insight into “deal­ers’ rings”. Three or four deal­ers would col­lab­or­ate on the pur­chase of an item, three of whom would refrain from bid­ding against each other in the hope that they could stop higher bids on the item. Later, amongst them­selves, one of them would pur­chase it. The club mem­bers then retired to Hall Golf Club for a lunch to cel­eb­rate forty years of Stumperlowe Probus Club. Michael Dowse had brought five items for the diners to exam­ine and to estim­ate the age, use and value of each object. This pro­duced wildly dif­fer­ent answers — only a few being near to the mark. Michael came to the con­clu­sion that our mem­bers, apart from being “unsale­able” were use­less as valu­ers! The mem­bers much appre­ci­ated Michael’s enjoy­able and enter­tain­ing present­a­tion and he was warmly thanked by every­one. David star­ted his talk with an account of the life of Robert Jones, who was a sur­geon in Victorian times. He was born in 1857 in Wales and left to study medi­cine at Liverpool University under the guid­ance of Hugh Owen Thomas. In 1881 he was assist­ant sur­geon at the Stanley Hospital, Liverpool and estab­lished him­self as a teacher and thinker. He pub­lished art­icles in The Lancet and was the first person to use X-Rays, and the first to use the “Thomas Splint”. This was a device that held the frac­tured leg firmly in an open frame thus allow­ing treat­ment of wounds and ulcers to be per­formed whilst the leg was still immob­il­ised. He was totally com­mit­ted to the care of crippled chil­dren and was involved in the cre­ation of Royal Liverpool Hospital for Children. During the con­struc­tion of the Manchester Ship Canal he was med­ical officer and set up three hos­pit­als en route and treated over three thou­sand patients. During the first world war he was hor­ri­fied at the treat­ment given to cas­u­al­ties and he set up Shepherds Bush Military Orthopaedic Centre. He believed that no sol­dier should be dis­charged from the army until everything had been done to make him a healthy and effi­cient cit­izen. He thus began modern day rehab­il­it­a­tion ser­vices. He men­tioned that the NHS is always under fire by the press and great pub­li­city is given to prob­lems like the Mid-Stafford shire invest­ig­a­tion where it was found that fin­ance took pre­ced­ence over the care of patients. There is a prob­lem with 7,300 patients per year com­plain­ing about adverse events e.g. post­pone­ment of oper­a­tions, drugs not given and gen­eral lack of care etc. The cost of lit­ig­a­tion in 2010 was £863 mil­lion. 15% of claims were of an ortho­pedic nature rising to 60% in the last three years. Common com­plaints included unsat­is­fact­ory out­comes 48%, dia­gnostic error 33%, nerve damage 32% and incor­rect oper­a­tion site 16%. The bed­side manner given to patients greatly influ­ences whether a com­plaint is made. Time spent with the patient and a friendly approach result in less claims. An abras­ive approach and less patient inter­ac­tion is likely to increase the number of com­plaints. David Stanley stressed that sur­geons need to know their lim­it­a­tions and, if in doubt, to phone a col­league for advice. Surgeons should know their own com­pet­ence, improve their skills, tech­niques and be will­ing to train other people. Surgeons should be spe­cial­ists in a lim­ited field i.e. knees, ankles, feet and just spe­cial­ize in those oper­a­tions. To achieve qual­i­fic­a­tions con­sult­ants have to undergo rig­or­ous exam­in­a­tions. The aver­age pass rate is 70% with more women passing than men. For stu­dents study­ing abroad there is a European Board of Orthopedic and Trauma Examination. The Northern General Hospital, Sheffield, holds a trauma con­fer­ence each day when all the X-Rays of trauma patients are dis­cussed. Those attend­ing include ortho­pedic sur­geons, radi­olo­gists, anes­thet­ists, neurosur­geons and theatre staff. A pre-assessment clinic decides if a patient is fit enough for an oper­a­tion. Before an oper­a­tion a World Health Organization check list is used to ensure that name band is in place, the cor­rect equip­ment is ready, whether the patient has any aller­gies and the site of the oper­a­tion is well marked. The talk stim­u­lated numer­ous ques­tions and was well received by the audi­ence.